Flicka meets Hogwarts in a title that combines the pony story with dragons. This clever combination will scratch two itches for many young readers. Thankfully, this story scratches with quality. As a long-standing non-lover of horses or their stories, this tale still kept me engaged. 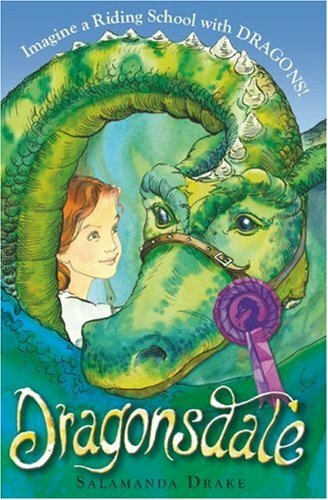 Underneath all the enthusing about the big beasts there’s a good, if somewhat predictable tale, of the girl who comes from the stables to triumph over others as a dragon rider. Along the way she encounters a foul brat – one of the story’s most memorable characters. Also along the way is a wealth of well thought out detail that resembles the sort of magic textbook of the ‘Dragonology’ variety. Dragons are put through various tasks, training logs are displayed – and there is the concept of the ‘Trustbond’, the connection between people and dragons, providing the basis on which they allow people to ride them. Like Hogwarts, the stable is packed with the detail of its own world – there’s even fun to be had with dragon manure. We’re told by the cover and blurb that the title is written by Salamanda Drake, a child from the dragon islands. In the absence of any alternative author name or blurb, who am I to argue? I’m sure, wherever the isles may be, Salamanda is cooking up the next volume, and that it will be eagerly awaited by readers of this one.